The insurer, rescued with a controversial $182 billion bailout in the 2008 crisis, has sold assets like AIA, rejigged operations, repaid the U.S. government, worked through CEOs and even started making acquisitions again. A new direction is emerging, but investors remain wary. A protestor carries a sign during a rally in the financial district in San Francisco, California March 19, 2009. 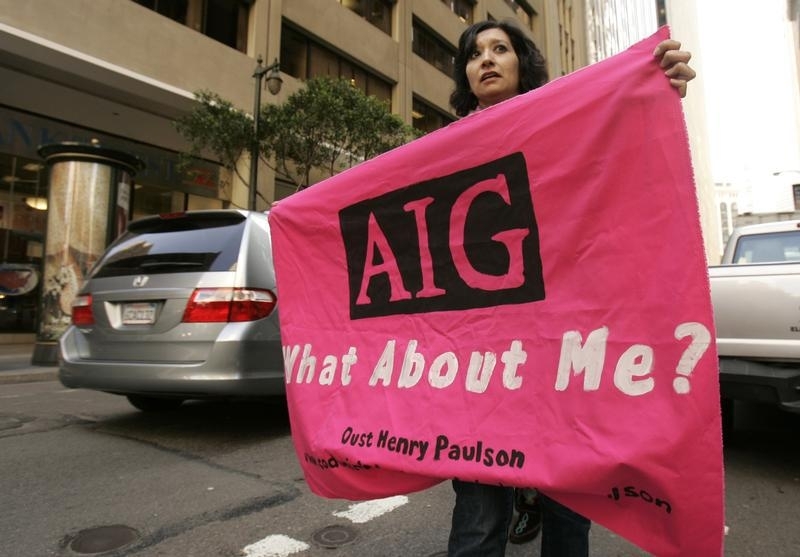 American International Group was bailed out on Sept. 16, 2008, receiving an initial injection of $85 billion from the U.S. government as losses mounted, notably in the insurer’s financial-products division. The rescue funding eventually reached $182 billion. Asset sales and other restructuring efforts enabled AIG to repay the government, plus an additional $22.7 billion by the Treasury’s reckoning, by December 2012. Chief Executive Brian Duperreault, who took over in May 2017, is AIG’s sixth CEO since the 2005 ouster of Hank Greenberg, who ran the company for nearly four decades.